Tiger Tales: A Detroit Tigers Blog: Zoom! Joel Zumaya made his first rehab start for the Lakeland Flying Tigers last night and pitched two shutout innings allowing one hit and one walk and picking up one strikeout. As the above picture indicates, he hit 101 MPH on the Joker Marchant Stadium gun. The stadium gun is a bit fast but I've been told he threw as high as 99 MPH and was snapping off some wicked curveballs too. 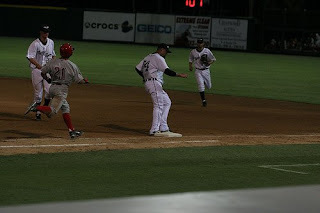 Also notice in the photo that he successfully covered first base on an infield grounder. If you saw last night's Tigers game, you know the importance of that maneuver. The Lakeland crew at MotownSports was able to watch the game and they posted some details. Fernando Rodney also pitched last night - for Toledo. he pitched two shutout innings allowing one hit and two walks and striking out one. Both Zumaya and Rodney have a ways to go before they will pitch for the Tigers but they are expected back some time this month if all goes well.